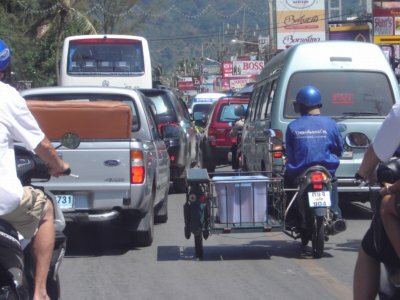 PATONG: The introduction of the new one-way traffic system in Patong passed without accident on its first day, January 15, but was marred by early evening traffic jams along Thaweewong Rd (beach road). Kathu District Police, determined to make the day a success, stationed a total of 75 officers on rotation from 3 am until midnight to direct traffic flow. Pol Col Teerapol Thipjaroen, Superintendent of Kathu District Police Station, told the Gazette, “On the first day of the one-way system in Patong we had a few small problems with vehicles moving slowly due to being unfamiliar with the system, but these are just teething problems and the one-way system will improve traffic problems in the long term. “We had no problems in the day time, but in the evening from about 5 pm to 7 pm there were tailbacks on Thaweewong Rd. That is rush hour in Patong when people finish work, tour buses take guests back to their hotels and tourists also going out to have dinner or to see a show. We will work on fixing this problem,” Col Teerapol assured. Col Teerapol admitted that the new system still lacks sufficient signs to direct traffic and blamed the problem on Patong Municipality’s budget shortcomings. “Because Patong Municipality has budget problems it may take a while until we have a full complement of signs in place,” he said. “Rat-U-Thit 200 Pi Rd had no traffic jams; the only problem was on Thaweewong Rd. We experienced no problems with traffic driving on the right-hand side on [sois connecting Thaweewong Rd and Rat-U-Thit 200 Pi Rd] such as Haad Patong, Sawatdirak, Bangla and Ruamjai. The reason we designed the system like this is that we didn’t want cars to have to cross each other when turning onto and off Thaweewong and Rat-U-Thit 200 Pi roads, which could have caused accidents”, he explained. “Now we have to improve traffic-flow control in the evening and increase the number and clarity of direction signs,” he added. “All in all, the first day of the one-way system in Patong was a 90% success. The other 10% was the traffic jams in the evening,” Col Teerapol concluded. On the other hand, Jaroen Trongjit, a motorbike taxi driver in Patong for more than 14 years, commented, “The introduction of the one-way system did not ease the problem of traffic jams on Phra Barami Rd between the Kalim and Khokmakham intersections, [caused by traffic coming off Thaweewong Rd]. One-way traffic will cause even more traffic jams. [On January 15] there were a lot of problems from 4 pm to 6 pm. Before there would only be traffic jams from 5 pm to 6 pm. The one-way system will also mean I have to drive further and use more petrol. I prefer the old system”, he complained.